The brutal killer of 49 worshipers at two mosques in New Zealand’s Christchurch has identified himself as Brenton Tarrant from Australia. On the pictures he uploaded on Social media, he had written the Greek word “TURKOFAGOS” with Latin characters on one of the weapons. But what does the word Turkofagos mean? It was attributed for the Greek revolutionary Nikitas Stamatelopoulos. Nikitas Stamatelopoulos was known by many different names; he was called Tourkophagos (Turk-eater) and Nikitaras, his name meaning “victory”. He was one of the greatest heroes and protagonists of the Greek War of Independence, next to his uncle, Theodore Kolokotronis. He fought in all of the major battles of the Greek War of Independence, proving his decisive role in its outcome. From a young age he was introduced to the harsh way of life of the harmatoles. After losing his father from the Ottomans, Nikitaras followed Theodore Kolokotronis throughout all his operations. His devotion to his uncle was recorded in the people’s saying “The head was of Kolokotronis, the arm was of Nikitaras”. In 1818, 3 years before the outbreak of the War, Nikitaras was initiated in the Society of Friends, whereupon he became an active member, travelling to Peloponnesus in attempt to initiate others and join the war that was slowly coming. 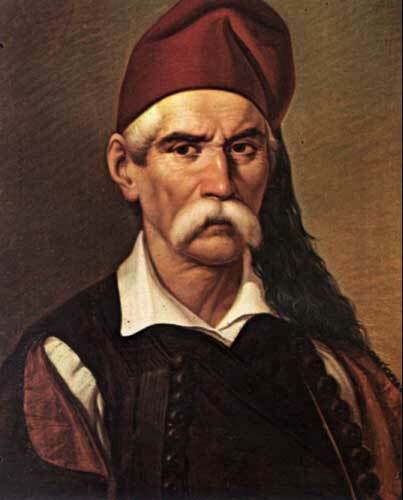 On March 23, 1821, Nikitaras joined Kolokotronis and entered in Kalamata. On May 12thof the same year, Nikitaras led an army of 800 troops victoriously against the Ottomans in the Battle of Valtetsi, thus granting the Greeks a victory in one of the most important battles during the war. Soon thereafter, he proved his military skills and valour in the Battle of Doliana, where he defeated 6000 Ottomans with an army of 200 Greek men. These two battles rendered him one of the most heroic fighters of the war. He continued in the Battle of Vervena, where he won the battles one after the other. Finally, on September 23rd of the same year, Nikitaras, together with Theodore Kolokotronis, Demetrios Plapoutas, Anagnostaras, Petrobey Mavromichalis and Demetrios Hypsilantis fought in the siege of Tripolitsa, ultimately reclaiming the capitol of Moria and decimating the Turkish and Jewish population. In 1822, along with 700 of his men he fought in the Battles of Stylis and Hagias Marinas, alongside Odysseus Androutsos. The apex of his heroic virtue was in the Battle of Dervenakia, the most important battle of the Greek War of Independence. The Greeks, led by Theodore Kolokotronis put an end to Dramali’s descent to Peloponnesus by facing 3000 Turks in the small mountain pass of Dervenakia. Nikitaras was also present here, alongside Demetrios Plapoutas, Demetrios Hypsilantis, Papaflessas and Panos Kolokotronis. It was in this battle that Nikitaras earned the nickname “Turk-eater” because during the battle he broke 3 of his sword from the force he was striking. Nikitaras was never absent from any of the major battles of the war. After the Battle of Dervenakia, Nikitaras continued fighting in a numerous battles, including the second siege of Mesolonghi, the victorious Battle of Arachova, on the side of Georgios Karaiskakis and his 800 men and the Battle of Phaleron, again together with Karaiskakis, who died in battle. Nikitaras lived long enough to see his homeland free and to live the ingratitude of the nation. He was an avid supporter of John Kapodistrias, who appointed him to various positions of power including President of the Hellenic Parliament. He attempted to open a paper manufacturing company but with the arrival of King Otto, the plans were abandoned. He was sentenced, imprisoned and beaten repeatedly while in jail until he was proven innocent and freed. The government granted him with a permission to “beg” outside the Church of Evangelistria every Friday, where he would go beg, almost blind. One day, when the Russian ambassador came to visit him while he was begging and asked him what he was doing, Nikitaras replied “I am enjoying my free homeland”. “You’re enjoying it here, sitting on the streets?” said the Russian ambassador. Nikitaras then said “My homeland has granted me with a pension, to live well, but I come here to take a glimpse of how the people are doing”. The ambassador realized and let a small pouch of golden coins to fall from his pocket was he was leaving. Nikitaras saw it and told the ambassador: “Your pouch fell down; Take it, so that you don’t lose it and nobody else finds it”. He died in utter poverty at the age of 68 from diabetes. Nikitaras remained in history as the most virtuous soul of the Greek War of Independence and one of the greatest heroic figures in Greek history, together with Theodore Kolokotronis, the old man of Morea, his most beloved uncle, whose tomb lies next to Nikitaras’. “Nikitaras”. Helios New Encyclopaedic Dictionary. Passas, I. Athens: 1946. Print. Konstantaras, Konstantinos. The Inglorious End of the Heroes of 21’. Hilektron Publications: Athens, 2016. Print.